Treat your sweet to a special Valentine’s Day at some of DC’s best restaurants offering decadent prix fixe menus & romantic packages to celebrate love! Join MXDC Cocina Mexicana by Todd English for your special Valentine’s Day dinner with a 3-course menu for $60/person including a complimentary cava toast. Chipotle Pasta Del Mar, Ribeye Steak, plus Lobster & Shrimp Paella for 2, are just a few of the delicious offerings to make your special day even better! Celebrate Valentine’s Day at Fig & Olive with a special “Day of Love” 4-course prix fixe menu for $75/person & $35 wine pairing for two, along with delectable specialty cocktails & live music! Make your reservations today for an unforgettable romantic evening. Join Charlie Palmer Steak for a romantic dinner in historic Capitol Hill, as they offer a 6-course prix fixe menu for $135/person prepared by Chef Michael Ellis. Menu available 2/14 - 2/16 to spread the love - make your reservations today! Join Teddy & the Bully Bar as they host a distinctive Valentine-themed menu from 2/14 – 2/16 that features 3 delicious courses for $65/person (wine pairing available for an additional $25/person). Their regular menu will also be available with plenty of wine & bubbly selections to choose from – make your date night reservations today! Get in on Abe’s romantic 3-course Valentine dinner at LINCOLN Restaurant for $60/person! Special menu will be available 2/14 – 2/16 along with their regular menu. Romance is in the air in the SE Waterfront as Declaration Nats Park features their 3-course Valentine’s menu for $40/person including a complimentary glass of bubbly! Special menu available 2/14 – 2/16 along with their regular menu – book your tables today! Forget chocolates, The Park at 14th is the perfect spot to celebrate with your sweetie this Valentine’s Day! Indulge in their 3-course prix fixe menu with offerings sure to please any palate. Combine with hand crafted cocktails, your favorite hits & cozy atmosphere, & you’ve got a night to remember. 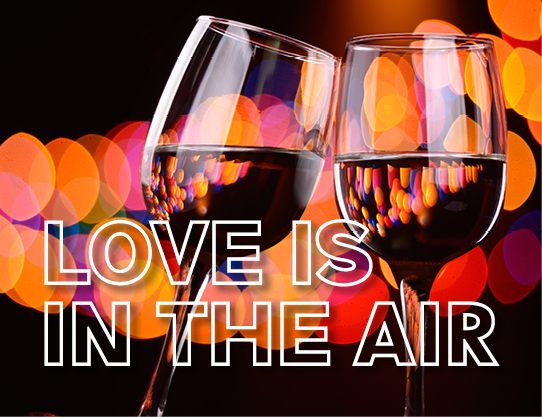 Enjoy a “Week of Love” at City Winery with a special 3-course menu & wine tasting available from Tuesday 2/12 – Sunday 2/17. Ticketed Chocolate & Wine Pairing classes will also take place at 6:30pm on “Galentine’s Day” & Valentine’s Day (2/13 or 2/14). Get your tickets & book your date night reservations today! Join Dino’s Grotto in Shaw this Valentine’s Day for a special 4-course menu for $59/person including a complimentary flute of prosecco! A la carte menu also available in the Grotto Bar. Tasting menu available 2/8 - 2/13 & 2/15 - 2/17 as well. Make your reservations today! Treat your Valentine to a special 5-course menu for $100/person at Capitol Hill’s Bistro Cacao! View the menu & make your reservations today. Celebrate the most exotic Valentine’s Day at Bangkok Joe’s with Chef/Owner Aulie B.’s 4-course prix fixe dinner menu for $59/person! A la carte menu will also be available – make your date night reservations today. Looking for a unique & romantic venue for that very special person? Head to Nazca Mochica in Dupont Circle to make it a special & memorable date! Chef Daniel Boulud’s DBGB Kitchen & Bar at CityCenter is offering a romantic 4-course Valentine’s Day menu, featuring seasonal dishes & decadent desserts. Join them from 5:00 – 10:00pm on 2/14 to experience their $80/person prix fixe menu for yourself! OpenTable diners have consistently voted Ristorante Piccolo as one of the most romantic restaurants in DC! The perfect way to celebrate the evening: romantic candlelit dining, 3 cozy fireplaces, a sumptuous 4-course Italian dinner, complimentary champagne toast, & a strolling violinist all for $80/person. BONUS OPTION: "Winter Social Hour" ($35/person) – available at the terrace & saloon bars – choice of four (4) items from the following categories: cocktails, wine, whiskey & bites. Join Catch 22 for Valentine’s Day to take advantage of their Couple’s Special: buy 2 cocktails, get one 1/2 off! Looking for a romantic Valentine’s getaway? Spend the evening at one of Maryland’s scenic historic farms! Geppetto Catering has partnered with Tusculum Farm in Laytonsville, MD to offer you THREE all-inclusive Valentine’s Day packages to choose from. Each package includes an overnight stay in one of Tusculum Farm’s luxury accommodations, plus a gourmet 3-course dinner including wine & a continental breakfast. To secure your romantic getaway, please call 1-833-RED-BARN or email info@tusculumfarm.com. Treat your sweet to a romantic culinary adventure at Osteria Marzano, where Chef Marzano has created an additional, exclusive menu comprised of aphrodisiacs from all over the world!